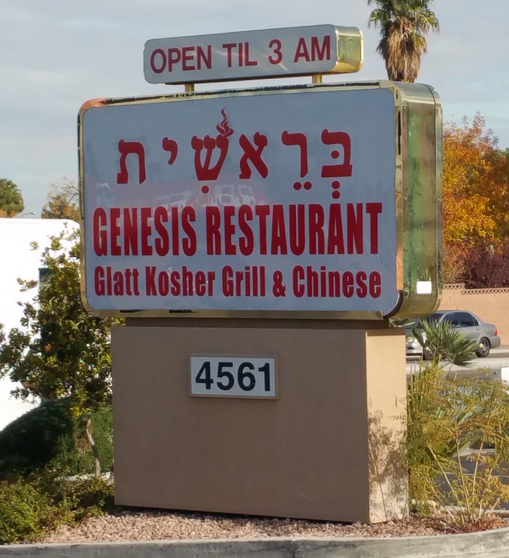 Adding to the robust kosher restaurant scene in Las Vegas, there’s a new meat restaurant, Genesis Restaurant (also using the name Bereshit/בראשית in Hebrew on its awning), dubbing itself a Glatt Kosher Grill & Chinese restaurant. Opening earlier this week, the restaurant will be open until 3am, making it the only kosher restaurant in town serving kosher diners during late night. While there are numerous kosher Mediterranean-style kosher grills in the area, this is a first for kosher Chinese food in Vegas. 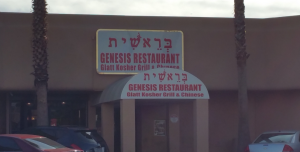 Kashrut for the restaurant is under the supervision of the Chabad of Southern Nevada. The restaurant is a short car ride from the Vegas Strip (about 10-12 minutes) and is walking distance from the Palms Casino. (Map Below).